As snowstorm looms, Jerusalem Mayor says this time the city is prepared; entrances/ exits will be closed as soon as snow piles up. Jerusalem District Police announced Monday that all entrances and exits to the capital will be closed when snow begins to pile up. The decision was made as part of just one of the lessons learned from the severe snowstorm that struck the city last winter. Thousands of motorists were stranded, without food or water, on Highways 1 and 443 after failing to comply with guidelines. This year, the municipality has recommended that residents and visitors avoid traveling on the roads during a snowstorm unless absolutely necessary. Israeli police issued a similarly strong warning last year to drivers in affected areas going out in blizzard conditions. Police also warned residents across the country to avoid leaving their homes for any reason during the snowfall. As a result of last year's storm, Jerusalem suffered 290 million shekels ($83.9 million) in economic and infrastructural damage, reportedly the worst in the country. In addition to the thousands of people stranded, a power outage hit more than half of the city, as well as areas in Judea and Samaria and in the north, leaving millions of Israelis without electricity, and often without heat, for days at a time. 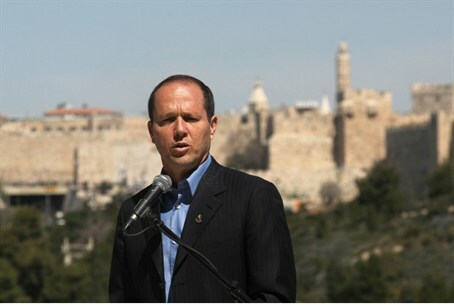 Nir Barkat, the Mayor of Jerusalem, arrived Monday afternoon at the Municipality's operational center, where he spoke to the media about Jerusalem's preparations for snow. "The forecast predicts that in another day and half or two days, snow will arrive in Jerusalem," the Mayor began. Indeed, the heavy cold front closing in on Israel is expected to hit full force starting late Tuesday, with deep snows anticipated to settle in on various parts of the country. "I am convinced that all of Jerusalem's children - in fact all of Israel's children - are praying for it to happen. I too remember the experience from when I was a child," Barkat continued. "Lessons from the great storm [of last year] have been learned, and the municipality and the Jerusalem police will finish all preparations, which took months, tomorrow." In a bulletin released by the municipality and police Saturday, Jerusalem residents were instructed to check that their heating systems work, clean gutters and trim branches close to power cables, and stock up on food and water. Addressing the city's intention to block roads immediately, Barkat pleaded with residents to take responsibility. "Everyone must take responsibility for his own home."